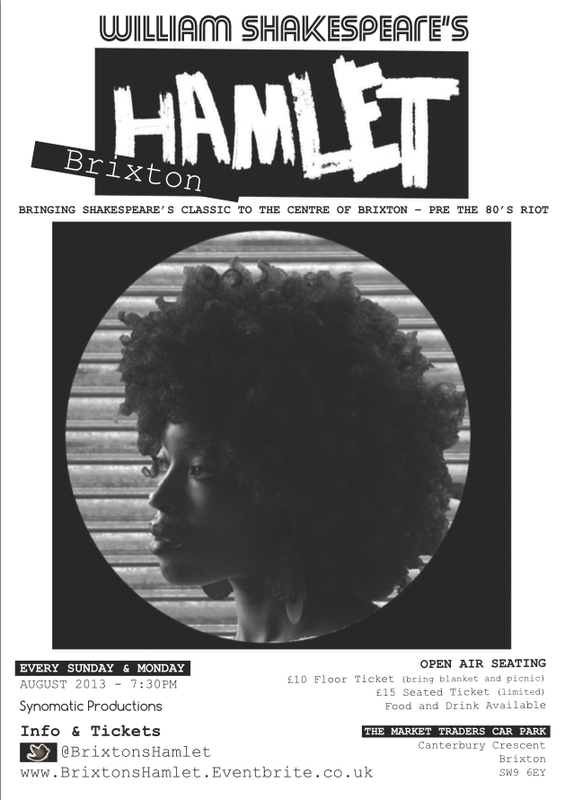 Fresh from the success of The Merchant of Venice in New York presented in a Camberwell pub earlier this year, Synomatic Productions are now creating a version of Hamlet in Brixton, based around the unrest of the 1980s. Forget Shakespeare in the Park - this is Shakespeare in the Car Park, and it's on every Sunday and Monday in August. 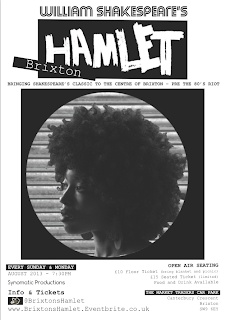 "Hamlet comes to the centre of Brixton, at the breaking point approaching the riots of 1981. To fit its urban setting, Synomatic Productions take a spin on Shakespeare-in-the-Park by bringing you Shakespeare-in-the-Car Park. This is an open-air production with picnics, world food and live music setting the ambience of a festive summers evening in Brixton’s urban backdrop. The air will be filled with the aroma of the Caribbean and infused with food of Brixton Market. Audience members will be encouraged to bring blankets, picnics and drinks to complete the summer experience. As a site specific company, Synomatic Productions is using the car park as its stage and auditorium, fully immersing the audience with the show. By 1980, a revolt was impending and the streets of Brixton had an air of discontent. The neglect of the government bred anger and bitterness resulting in a deep-seated unrest. Synomatic show Hamlet as the struggle of Brixton and his family as the manifestation of this struggle. This is a performance of Hamlet as a victim of circumstance among a family with a reputation that has grown powerful and violent in Brixton. Synomatic Productions are inspired by immersive venues in the hope of bringing exciting theatre. In April, Synomatic produced their first site specific production of, William Shakespeare’s, The Merchant of Venice. It was set in 1930’s New York with the backdrop of The Cambria as our speakeasy. Our aim is to produce innovative theatre and we have a particular passion for Shakespeare."